SKU: SPEX121. Tags: 200 TDI CONVERSION PARTS, 200TDI SERIES CONVERSION PARTS, CONVERSION EXHAUST PARTS, Land Rover Parts, Land Rover Spares. SPEX121 Front Exhaust Pipe 200Tdi Disco Conversion To LR Series. Exhaust Front Pipe for Right Hand Drive & Left Hand Driver Land Rover Series 2 – Series 3 Short Wheel Base & Long Wheel Base Models with Discovery 200Tdi Engine Conversion. This Larger bore front pipe is made to fit to our larger bore exhaust system. Manufactured in Aluminised mild steel. This is from the Turbo outlet (the little cast iron manifold is removed) and finishes up at the bottom of the engine. STEVE PARKERS LTD have been designing and manufacturing conversion exhausts for over 20 years. 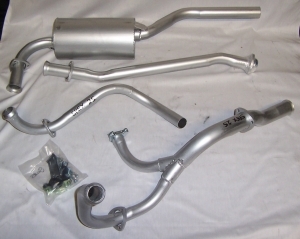 Many of our exhausts are made in aluminised mild steel or 304 grade stainless steel. The exhausts are designed for the engine requirements. We also try to use the standard chassis brackets and rubber mountings. However on some models other brackets may be required due to the many models of Land Rovers.